A bunch of turkeys are dressed up as indians and pilgrims waiting for you to print them out, color, cut and play tic-tac-toe against your favorite opponent. 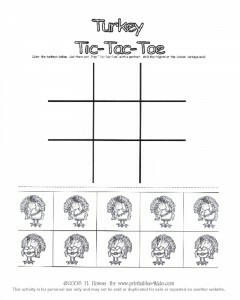 Print out a few copies and paste them on cardboard and host your own Thanksgiving day tic-tac-toe tournaments. Don’t miss the rest of our Thanksgiving printable coloring pages, word games, and activities.